Alphabet photography frames are a perfect addition to any home. They make for unique decor and fabulous gift-giving, but they can be expensive. Get the look at half the price with this simple letter photography DIY that's not only easy, but affordable and lovely! Alphabet photography refers to photos taken of nature and architecture that resemble the letters of the alphabet. Strung together, the images are absolutely stunning, so it's not a surprise that alphabet photography frames are popping up in so many homes! We love the look of family names and favorite words created and displayed in this unique, attention-grabbing way. 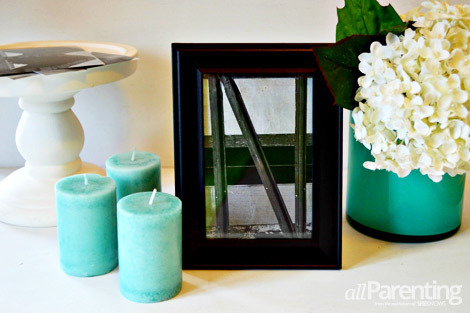 In other words: Alphabet photography frames are a chic must-have trend in home decorating! The only downfall is they can be ridiculously expensive. But with just a few supplies, you can make your own DIY version for less than $15! Start by deciding what word you'll be creating and then download your letters from a site such as Clutterbug. Order your photos at your local grocery or drug store. Most stores only charge approximately 30 cents per picture! 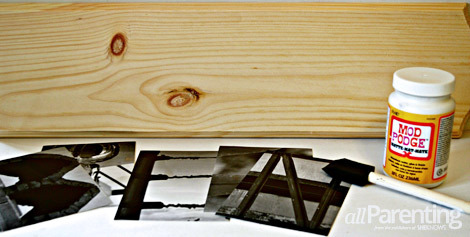 I edited my alphabet photography letters on the store's site that I used to order my photos, zooming out a little bit, giving me room to trim my photos to fit my board. Because our last name has five letters, I chose an 18-inch board and cut my photos to 3-1/2 by 5 inches. Next, arrange your letters on your board with the spacing you prefer. Then, spread a medium even layer of Mod Podge onto the board. Cover the same width as your first photo with a little bit of room to spare. Carefully place the first photo on top, lining up the edges. Continue spreading the Mod Podge and placing your photos side by side until your word is complete. Remember that Mod Podge dries clear, so it's OK if drops land on your photo. Simply smooth them out with your foam brush. Once your word is complete, paint a medium coat of Mod Podge on top of the whole word. I found one layer of Mod Podge to be perfect, but if you'd like to put a second coat on, just wait for the first coat to dry and repeat. It takes about a half hour for Mod Podge to dry. one more thought^You can also create alphabet photography frames by downloading and printing the letters, and then framing them in multiple opening frames. These can be hard to find with more than four slots, so if your last name has more than four letters, individual frames placed side by side look lovely as well!